Our favorite grumpy bear is back just in time for the holidays. 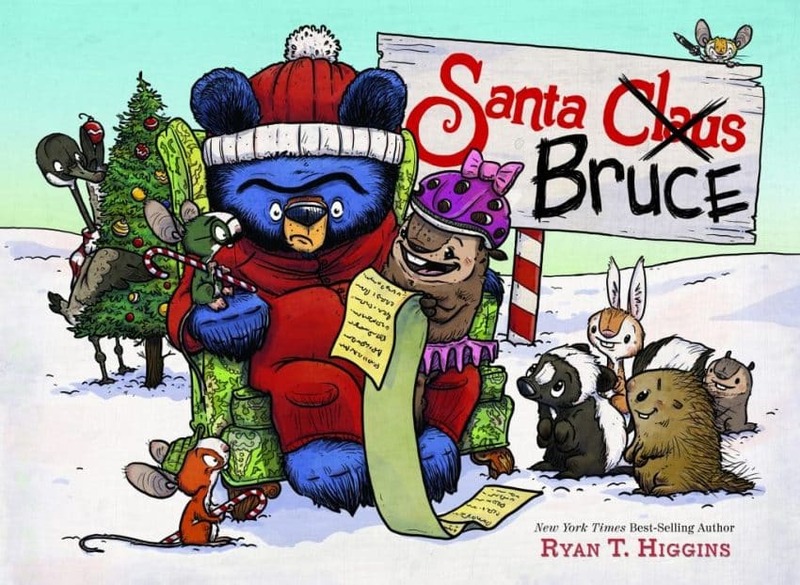 Santa Bruce is the fourth Bruce book from Ryan Higgins and we are here for it! Santa Bruce is a fun story about our reluctant hero who just wants to be left alone. In Santa Bruce, Bruce is mistaken for another Santa and winds up delivering presents to all the woodland creatures in the forest. Kids and adults will love following Bruce’s adventures and may even relate a teeny bit to his bah humbug spirit when things go wrong. The Bruce books are so fun to read aloud, especially with young kids, and Santa Bruce is no different. Kids of all ages will love this story and it’s a fun way to get excited for the holiday season. I don’t know about you, but my boys are always drawn to grumpy characters. And I love Bruce because even though he argues, he always comes through for his family. Next year though, he is definitely sleeping through Christmas. Not only is Ryan T. Higgins the author of Santa Bruce, he’s also the illustrator! And while he is NOT a grumpy old black bear, he DOES a great job making books about one. He lives in Maine with his wife and kids… and too many pets. I love the artwork in these books and the colors are so beautiful. Bruce books are quality and I’m sure you’ll want to keep them on your shelf for years to come. Read more from Ryan T. Higgins, including award-winning Mother Bruce, Hotel Bruce, and Bruce’s Big Move. 1 Grumpy Bruce: A Counting Board Book is also available for pre-order and will be released in October. Want to win your own copy of Santa Bruce? Our friends at Disney Book Group have provided the perfectly grumpy prize pack. 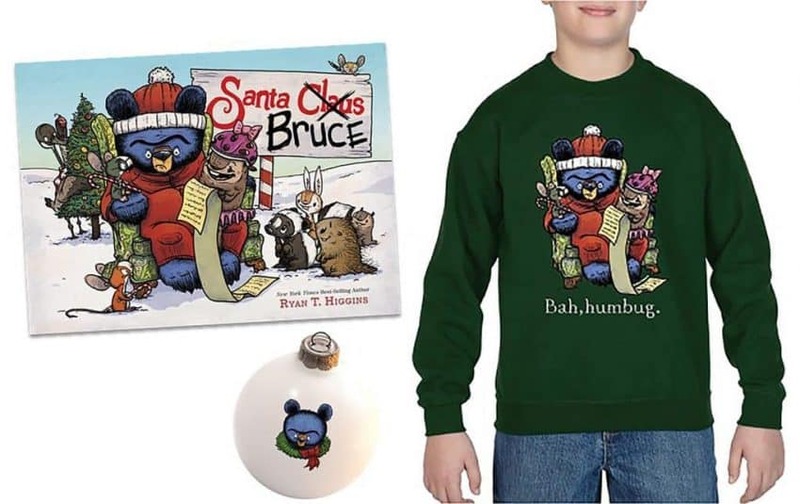 One winner will receive a copy of Santa Bruce and branded ornament and a kids-size “Bah, humbug” sweater/sweatshirt. To enter: Leave a comment on this post with your favorite holiday tradition! Entries will be accepted through 11:59pm ET on September 27, 2018. One winner will be randomly selected and contacted via email. Giveaway open to US addresses only please. Good luck! Stay in the know by following Disney Book Group on Twitter, Facebook, and Twitter. Let’s connect! Subscribe to our newsletter to get a note monthly with our latest posts and encouragement as well as a free guide to stop procrastinating today! The Ultimate Disney Halloween Guide: Parks, Movies, Books and More! My favorite holiday tradition is baking a fresh batch of chocolate chip cookies to leave out for Santa on Christmas Eve. We have a basket of Christmas theme books we set out by the fireplace to read in the evenings. I love the day our family goes out, chooses a tree and then decorates it. We have Christmas cookies and hot chocolate and tons of fun looking at all of the ornaments and decorations. We always cut our Christmas tree down as a family when I was growing up and now I do it with my family. We read a Christmas book every night starting the night after Thanksgiving. My favorite holiday tradition is putting on pjs, sipping hot cocoa and watching Christmas movies on Christmas eve. I like eating my mom’s yule log cake. My kids and I love to make christmas cookies. We top our Christmas tree with a lopsided homemade tinfoil star my Dad made when our tree topper was broken. This happened when I was a child many years ago and it is a sweet reminder of my late father. My family has a gingerbread house contest every year. I like to decorate the tree with the help of my children. My favorite Christmas tradition is picking one present to open on Christmas Eve. My favorite holiday tradition is making decorated sugar cookies with the grandkids. Our favorite holiday tradition, is setting up the tree and decorating the day after Thanksgiving Day. I have to say my favorite tradition the past few years is when our Elf brings a box of individually wrapped books on December 1st with a note for our little one to open 1 book each night for our bedtime story. When the books are gone…its Christmas! We have so much fun getting new books ….and he loves opening one every night before bed! Reading books before bed is one of my favorite times of the day! Enjoy it so much! I really like taking the kids treat or treating. We all love to dress up and make the rounds. My favorite holiday tradition is decorating with the kids. They mere fact of putting stuff out makes them so happy. I enjoy looking at Christmas lights. We set aside a night to tour the lights and stop for hot chocolate on the way home. My favorite tradition is baking christmas cookies. it always gets me in the mood for the holidays! My favorite holiday tradition is attending my sister’s annual Christmas party. I enjoy seeing my family and my sister is an awesome cook. My favorite tradition is decorating the Christmas tree! Our favorite family tradition is having a huge dinner Christmas Eve and than playing White Elephant! My favorite holiday tradition is going to the Festival of Lights a couple of cities over and seeing all the lights and hear the music. Going with the whole family to sing Christmas Carols. I love our family cookie baking extravaganza. My favorite tradition is getting a new pair of pjs for the whole family and snuggling up with some cocoa and fresh pjs for a Christmas movie marathon! My favorite holiday tradition is taking the family to cut down a Christmas tree followed by hot chocolate and candy canes. Every year our family takes a silly family photo. Last year we all wore plaid pajama pants with red or white shirts in front of the Christmas tree. Two years ago, our silly photo involved everyone wearing an outrageous Christmas/Santa hat. My favorite holiday tradition is when our family goes to a local tree farm to pick out & chop down our Christmas tree! My favorite holiday tradition is making and decorating festive sugar cookies with my kids. I love our tradition on Christmas eve grabbing some doughnuts and chocolate milk and driving around looking for Christmas lights! Christmas Eve PJ’s and Santa cookies and milk. My favorite Holiday tradition is decorating the Yule log. My favorite tradition was opening a new book every night in December until Christmas Day. I did that with my youngest daughter, but then kind of quit doing it. I plan on bringing it back this year with her and our newest daughter! We go to the movies on Christmas Eve. We open stockings before breakfast and presents after breakfast. Favorite tradition is decorating the house for christmas. My favorite Christmas tradition is the present we open on Christmas eve- it is always pajamas, hot cocoa, etc. My favorite holiday tradition is picking out and decorating our Christmas tree every year! My favorite tradition would have to be decorating the tree and the house with my children and baking cookies together. Togetherness is the best part in my opinion. Decorating the house and tree with family! My favorite tradition is making holiday cookies with the kids and decorating them and sharing them with the neighbors. My favorite holiday tradition is getting together with my whole family for good food, fun and friendship. We make lots of Christmas cookies. We spend Christmas Eve day making treats for Santa. My favorite holiday tradition is going to get the Christmas tree as a family! My favorite holiday tradition is riding around together as a family looking at Christmas lights. We are Catholics and our most important tradition is Midnight Mass. My favorite tradition is putting the Christmas tree up as a family — we have pizza, beer and put up the tree. setting cookies out for Santa on Christmas Eve. My favorite holiday tradition is helping the kids decorate our Christmas tree. Our favorite Christmas tradition is having the whole family over to frost and decorate cutout sugar cookies! Creative, sweet, messy Christmas fun! We enjoy going over to our friends house for dinner. Everybody brings food. We have been doing this for years. We watch Prancer together and have hot chocolate and cookies. Our family tradition is having a Christmas Eve party in our PJs. “Santa” makes a quick appearance to give each child a small gift. We love to bake Jesus a birthday cake and sing Happy Birthday to HIm on Christmas day as a family!